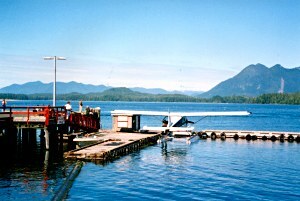 The community of Tofino British Columbia is located on the west coast of Vancouver Island. Situated on Clayoquot Sound, at the northern boundary of Pacific Rim National Park, Tofino is a relaxed, casual vacation destination; a place to get back to nature and experience west coast British Columbia; whale watching, angling for salmon, beach combing, sea kayaking, ocean vacations and eco adventures. You can walk for hours on Long Beach and experience the constant rhythm of rolling surf, the power of a winter storm or the silence of a protected bay. Explore Pacific Rim National Park and you'll find pathways that lead from the beach through the rainforest to secret coves and beach caves. The community can provide opportunities for shopping, visiting craft shops, museum and art galleries and watching the busy harbour. Just moments away, you can sail, cruise or fly to Hot Springs Cove to bask in the natural hot pools and waterfalls. Visitors can also take guided whale watching tours, nature and scenic eco adventures, or guided salmon charters; or perhaps a sailing trip around Meares Island; the more adventurous may want to experience sea kayaking around the islands and bays that dot the west coast of British Columbia. Whale watching is most rewarding during March and April when the whales are migrating from Mexico to the Arctic Ocean. This coincides with the Pacific Rim Whale Festival which also offers a wide range of other activities from crab races to golf tournaments, concerts and plays. Salmon fishing and flyfishing in Clayoquot Sound are world famous. Take guided charters or rent a custom built flyfishing boat and explore on your own. 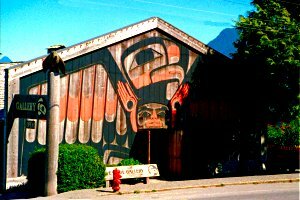 Visitors to Tofino can also experience the rich native heritage of the area in the many Native galleries and craft shops. Tofino British Columbia is 42 km (26 mi.) north of Ucluelet on Highway 4, 130 km (81 mi.) west of Port Alberni and 337 km (209 mi.) northwest of Victoria. Regional air and bus lines service the area. 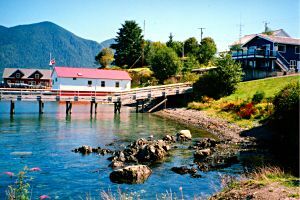 The Tofino area offers the tourist a variety of vacations including commercial campgrounds, motels, hotels, beach-front resorts, lodges, and unique bed and breakfast establishments. golf course, angling, sea kayaking, whale watching, sailing, boating, charter tours, hot springs, hiking, camping, sightseeing, photography, beach combing on Long Beach, fine dining, west coast eco adventures.